A wedding dress is perhaps the most special and emotive garment a lady will ever own. We understand this and for this reason we are dedicated to providing you with outstanding service in the cleaning of your wedding dress. 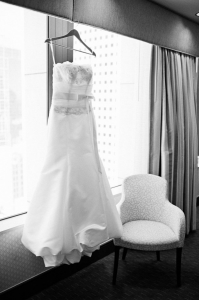 Your dress will be inspected prior to cleaning to ascertain what treatment best benefits your dress. We will then manually remove the stains by hand before cleaning your dress. After cleaning we will re-inspect your dress and decide if any further treatment is necessary. Only once we are completely satisfied will we press your dress by hand. Alternatively email us, please give as full a description as you can: make of dress, material, style, is it badly stained? We can usually provide fairly accurate pricing estimates without seeing the dress with this information.